In addition to using the internet to choose a restaurant when traveling, I often ask for recommendations from locals and when dining at other restaurants in the area. That’s how we landed at Mud Street Cafe in Eureka Springs, Arkansas. Every single time I asked for a breakfast recommendation on our visit to Eureka Springs, Arkansas, I was told we MUST eat at Mud Street Cafe. Those recommendations were good ones! 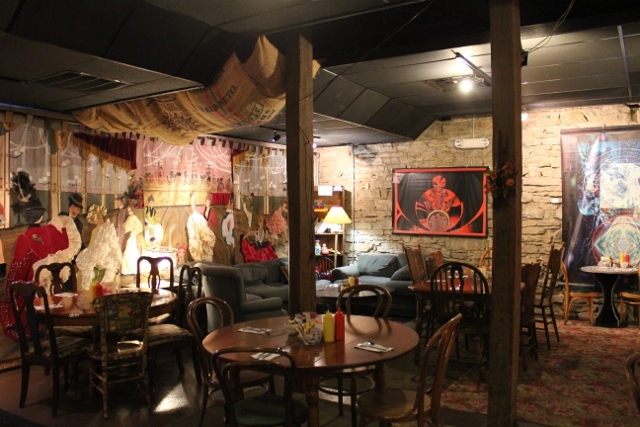 As you enter Mud Street Cafe from the street level, you descend down a flight of steps into the underground of Eureka Springs. But it wasn’t always this way. The name “Mud Street” is because what is now the basement level used to be the street level. The street was built up in the late 1800’s to prevent flooding from the spring that still runs beneath the buildings. The building, constructed in 1888, features limestone walls, huge wooden beams and eclectic decor that makes for an inviting spot for breakfast. I had plenty to pick from when selecting a breakfast entree. The first three entrees and all but one of the omelets on their menu would work with minimal modifications for a gluten-free vegetarian. Super easy! Our waitress was very knowledgeable about what would and wouldn’t work on the menu. She even confirmed my questions without me even prompting it once I said I had to be certain there was no gluten in my meal. 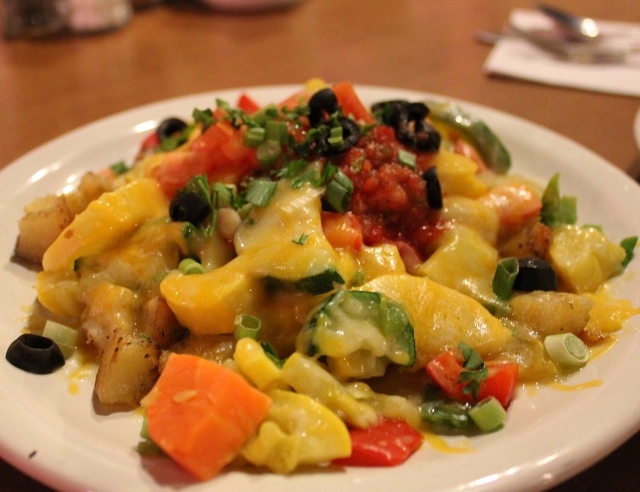 I decided to go with the Veggie Hash Browns, cottage fries topped with steamed fresh veggies, cheese, salsa, tomatoes and sprouts. I’m a happy girl when a restaurant brings out breakfast that includes zucchini, carrots and black olives plus just about every other vegetable the kitchen could toss in. Good stuff and more than enough for a super hearty breakfast. There was no way I could finish all of this. But I sure wanted to! 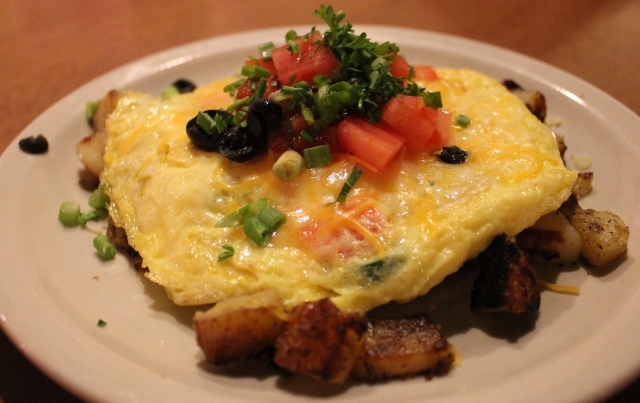 My favorite fella had the Chef’s Scramble, an open-faced omelet with veggies, cheese, salsa and tomatoes. Another plentiful dish, but quickly polished off . Some mornings it takes more than a cup of coffee to get me moving. One thing I really liked about Mud Street Cafe was the self-serve coffee station. No impatient toe-tapping while you wait on the server to come back by with hot coffee, just fill your cup up anytime you’d like. There is even a variety of coffees to choose from, including their own Mud Street blend, a dark roast that made my morning much more enjoyable. 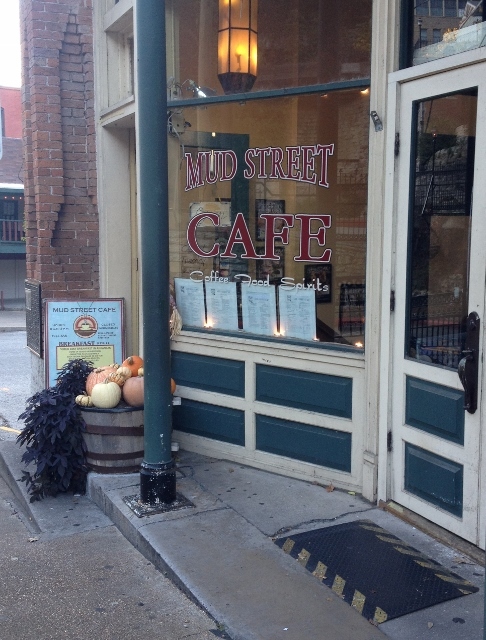 Mud Street Cafe is definitely on my list of restaurants to visit on our next trip to Eureka Springs. Next time I’m going for an omelet but can’t decide from the six options that fit into the way I eat. It’s so nice to have lots of options! Looking for other tasty options while visiting Eureka Springs, Arkansas? Please visit my posts on The Stone House and Local Flavor Cafe. « Soften Saturday: I HATE the Gym! Thanks, Johnna! I live in OK and used to travel to Eureka Springs sometimes, but it dropped off my radar. Thanks for the reminder! Would you care to recommend a place to stay? Cyndi–We drove to Eureka Springs from OKC on this trip, visiting POPS and driving along as much of Route 66 as we could. Great fun! We were in Eureka Springs for a conference that was held at the Best Western Inn of the Ozarks (www.innoftheozarks.com). While not an historic hotel or a B&B, it was really nice. The staff were super folks, our room was large, clean and well kept. We had a nice view out into trees that frame their swimming pool. And there was plentiful parking, which hasn’t been the case everywhere we’ve stayed. It’s rare to find a veggie dish for breakfast. Great find! This is true! In a town with limited breakfast options, it was a great treat.